Thankfully, there are alternative feeding methods that can help deliver nutrients to baby when mom is away. One of these methods is cup feeding. Did you know even tiny infants can drink from an open cup with the help of a caregiver? Now, we aren’t talking about a coffee mug here. The best cups for a young baby are small with rounded edges, like a shot glass or even a disposable condiment cup. Slow pacing with lots of pauses can help baby to drink milk using this tool! Greater risk for spilling the liquid gold that mama pumped! If your baby is resisting bottles, try talking to your lactation consultant about cup feeding. 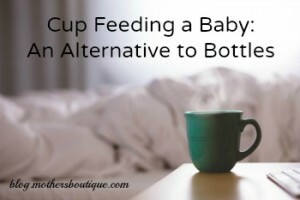 This article from La Leche League International shares mothers’ experiences using cups to feed their babies. Did you try cup feeding? Leave us a comment to share your story! *All information in this post is parsed from chapter 21 of the textbook Counseling the Nursing Mother by Judith Lauwers and Anna Swisher.